Peanut Butter Boy has been busy, lots of stuff going on, so I apologize for the infrequent updates! I’d love to post a new recipe every day – heck, I wish I didn’t have to work and could spend all day creating new, creative dishes to share with all of you. But that’s not the case, at least not yet. Maybe once Emeril or “The Situation” mention that their inspiration for greatness came from The Peanut Butter Boy, then things will change. Until then, enjoy the less frequent but no less delicious recipes! 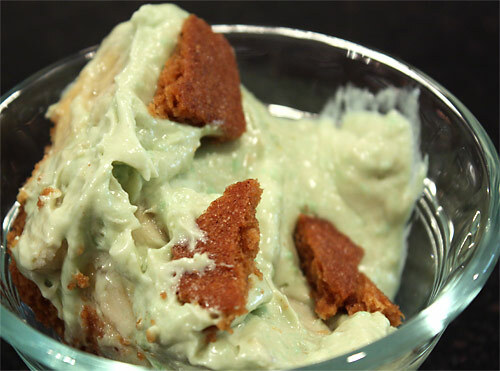 Here, I take yet another twist on the smash hit Peanut Butter Banana Pudding by combining the flavors of pistachio and ginger. 1. In a large bowl whisk together the greek yogurt, peanut butter, whipped topping and milk until no clumps remain. Stir in the instant pudding slowly until well incorporated and mixture begins to thicken. 2. In a large glass serving dish or trifle bowl, form a layer of ginger snaps, flat side facing up. Cover with a thin layer of pudding, followed by a layer of banana slices. Add another thin layer of pudding and repeat. Or get creative by pudding (hah!) some wafers against the wall before adding the next layer of pudding for a nice presentation. Top with a few more ginger snaps. Refrigerate for at least 8 hours before serving for best results. That is such and easy recipe and I can just imagine how great it tastes. Yum. Thanks for sharing. I was just thinking the other day, I love banana pudding. I wish I could do something different with it. Bingo, here it is. Cannot wait to try this. Thanks. Great minds think alike Dorinda! I was reading your last post about your friend who is allergic to Peanuts. I actually had a daughter who outgrew this allergy last year. We have to give her peanut butter and lots of it. Doctor’s orders: apparently the allergy can come back. Outgrew the allergy? Congrats to her! So the doctor says to keep giving her more peanut butter so she doesn’t revert? That’s possible? There’s so much I don’t know about peanut allergies (and hope I never find out)!